Hortus Camdenensis | Gladiolus cunonius (L.) Gaertn. Cormous perennial with linear leaves, to 35cm long, spirally twisted towards the end and the spikes of up to 8 bright red flowers, with the 3 lower lobes yellow or green, appear in spring. [RHSD, CECB]. ‘Amidst that variety of tender bulbous plants which the Cape affords, there are none whose flowers can boast a richer scarlet, than the Antholyza here figured; in their form also, there is great singularity, and in their mode of growth much elegance; to us indeed it is matter of surprise that this plant should not be more generally cultivated, especially as its culture is attended with so little trouble: Mr. Miller, who grew it in 1756, has minutely described it in his Dictionary; he informs us, that it is easily propagated by offsets, or raised from seeds; the latter, as the plant flowers in April and May, ripen about the middle of June, and thould be sown about the middle of August; the plant with the pot in which it has grown, after it has ripened its feeds, thould be set by in a shed or some dry place, and in the autumn the largest roots should be selected, and three of them planted in a pot of a moderate size, keeping them in an open frame till the approach of winter, when they are to be removed into the house with other green-house plants. This species is found wild in Persia as well as at the Cape.’ [BM t.343/1795]. ‘The floral emblem of the soldier, its leaves are sword-shaped and its banner-like flowers are red’. [Gard. Chron. 1842]. Redouteé L pl.12/1802-15. Listed in the 1845, 1850 and 1857 catalogues [B.134/1845]. Probably introduced by John Bidwill. [See Gladiolus cardinalis Curt.]. 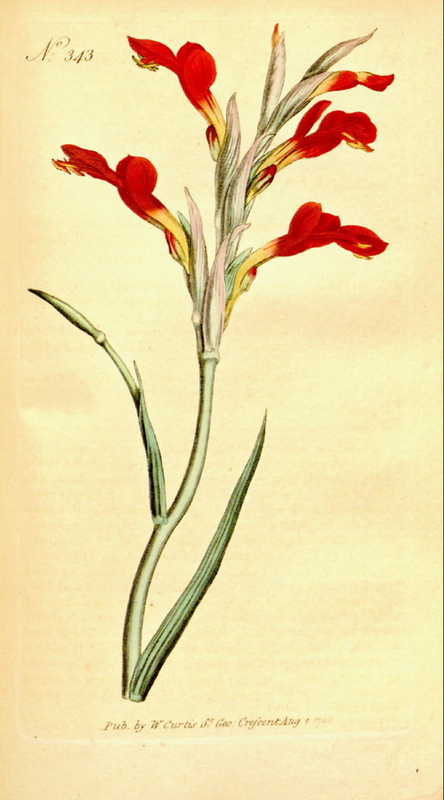 More details about Gladiolus cunonius (L.) Gaertn.